I am Bob Abel's daughter, Missy. I help dad as much as I can with his business. I do not design chairs, or help in the shop. That requires a lot of patience and time. As a wife and a mother of three, it leaves me very little time. Someday maybe I will be able to learn the craft. I have the two best jobs in the world. I have been blessed to have the opportunity to stay home and raise my three beautiful children. They are my number one and the most important part of my life. I receive all e-mails for dads business, and can normally answer all questions very promptly. 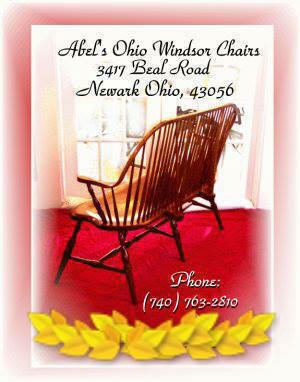 I am honored to be a part of my dads Windsor chair business. I am very proud of the work my dad does. After an order is placed I send out updates and pictures as the orders are being created. So you can follow your gorgeous creation as it is meticulously designed. I also designed this web site, that I update often. I am self taught. So it has been a lot of research and learning. I do most of my work in the evenings when my kids are in bed, this is my time. It gives me time for a little independence and self worth. I love designing web sites.